etc., or as fractions, like , etc. 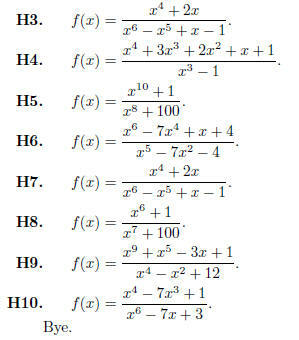 For all of these functions, we have 1 divided by something , and this can never be zero. 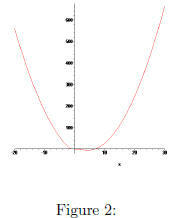 Power functions with negative exponents will never intercept the x -axis. that is very small, that is, very close to zero. will say that it will approach the y-axis asymptotically. that the graphs approach the x-axis to the left and right, and they approach the y-axis in the middle. Second, as the exponents get larger, the function values approach zero faster, and they go to ±∞ faster. For larger negative exponents, the graph is closer to the x-axis and further from the y-axis. letter of the graph that most resembles your sketch. values of x. 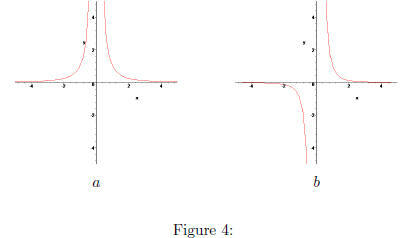 For example, for the function f given above, x4 and x2 dominate the end behavior of the graph. wiggly in the middle, but somewhat parabolic on the ends. means that it should approach the x-axis from above on both ends. The graph is in Figure 3. Now consider the function i.
from below on the left end and from above on the right. It’s graph is shown in Figure 3. Next, consider the function j.
also shown in Figure 3. Again, we’ll look at the middle behavior next time. Today, we’re just looking at the ends. enter the letter of the graph whose end behavior most resembles your sketch. For each rational function, determine which graph in Figures 4 and 5 has the most similar end behavior. The letter under the graph is what you’ll input into Blackboard.